The small magnetic loop antenna is a compact efficient antenna that is ideal for portable deployment or for limited spaces and that can be improvised inexpensively. The antenna is essentially a tuned circuit with an inductor formed by a loop of wire measuring less than 1/4 wavelength and resonated to the operating frequency with a capacitor. Due to its low radiation resistance and large circulating current, the loop must be constructed of a large outer diameter conductor of low resistance for best efficiency. Typically these loops are built from coaxial cable, hardline, or copper or aluminum tubing. These loops have a very narrow bandwidth and require a variable capacitor (and preferably a reduction drive) to be resonated at the operating frequency. Air variable capacitors or vacuum variable capacitors are used due to the voltage on the order of several thousand volts that is developed across the capacitor. In order to maintain the lowest possible series resistance, soldered connections and a "butterfly" or split-stator capacitor are preferred. The addition of a fixed capacitor in parallel with the variable capacitor will allow operation of this antenna on 7 or 10 MHz at reduced efficiency. 1. Materials used for the tuning enclosure: 3¼” x 2½” x 4½” craft storage box from Michael's (2 for $2.99), 1/2" conduit clamp (5/$0.99) and .08" acrylic sheet ($1.99) from Lowe's, and a Jackson Bros. 4511 DAF 6:1 planetary reduction ball drive. 2. Butterfly capacitor ($5 at swap meet), 19 plates 1.5" diameter, 0.02" plate spacing provided 24-116 pF per section, or an effective 12-58 pF tuning range as we use the sections connected in series. The calculated voltage rating is 2-5 kV. A piece of the acrylic sheet was cut and drilled with a Dremel tool and mounted to the front of the capacitor. 3. Another piece of acrylic sheet was cut and drilled to mount the reduction drive needed due to the very sharp tuning at resonance. Reduction drives are available through The Xtal Set Society and MFJ Enterprises. An angle bracket was attached to mount the assembly inside the tuning enclosure. 4. The assembled tuning enclosure. The shell of a SO-239 connector was soldered with 8 AWG stranded copper wire to each stator section of the butterfly capacitor. The center pins and the capacitor rotor were left unconnected. The NE-2 neon lamp serves as a resonance indicator. Both leads of the lamp are soldered together to only one of the stator sections. The lamp is in the air about an inch away from the other stator section. 5. 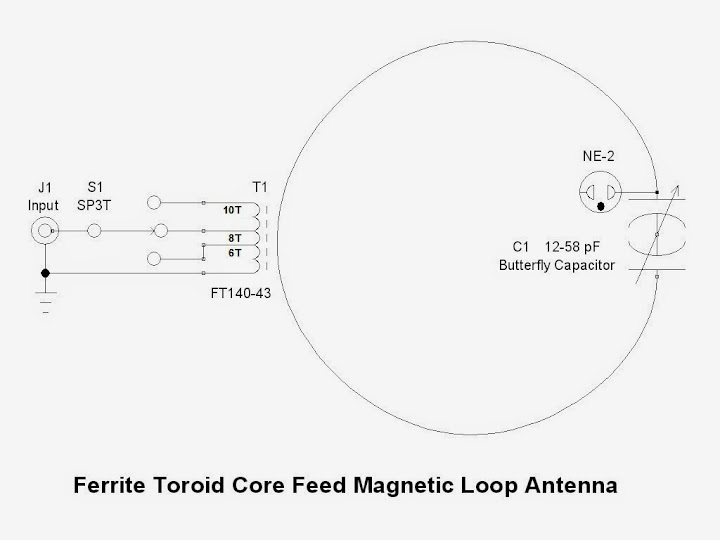 Schematic diagram of ferrite toroid core feed Magnetic Loop Antenna with variable transformer ratio. The transformer will couple the very low impedance of the loop to the 50 ohm impedance of the transmission line. As described by G4FON on http://www.g4fon.net/MagLoopTwo.htm2, a 3 position switch was wired to vary the transformer ratio, selecting taps at either 6, 8 or 10 turns to achieve the lowest SWR on each frequency band. 6. A wide-spaced 10-turn coil of 14 AWG solid copper wire was wound on an FT114-43 or FT140-43 ferrite toroid core threaded over the loop wire (a 112 inch length of Alpha Wire 9219A RG-8A/U coaxial cable terminated in PL-259 connectors). Taps would later be soldered on the 6th and 8th turns after mounting in the coupling enclosure. Spreading the coil turns over the full circumference of the core distributes the magnetic field and thermal losses throughout the core, raising the effective core saturation threshold, improving coupling efficiency, antenna Q and radiated field strength. The larger diameter FT140-43 core provides equally tight coupling to the loop, greater power capacity and permits an easier fit over the loop. 7. A view of the toroid core in the coupling enclosure. The 3 position slide switch selects 6, 8 or 10 turns of the primary winding on the ferrite toroid core. The SWR was 1.2:1 or better at resonance. The best match occurred with the 6 turn tap on 28 MHz, the 8 turn tap on 18, 21 and 24 MHz and the full 10 turns on 14 MHz. 8. A view of the bottom of the coupling enclosure showing the 3 position switch and BNC connector. This 3 position slide switch was salvaged from a defunct blow dryer. 9. The magnetic loop antenna assembled on a 5 foot length of 1/2 inch PVC conduit and secured to a tripod with Velcro straps. The ends of the 112 inch loop of RG-8A/U coaxial cable are attached to the SO-239's on the tuning enclosure. The transmission line is RG-58/U coaxial cable with several turns wound into a coil at the feed point to form a choke balun. The capacitor is adjusted using a vinyl mini-blind wand attached to the shaft of the reduction drive with a small hose clamp. 10. A close-up view of the tuning enclosure with the NE-2 neon lamp glowing at resonance on 14 MHz at 5 watts. 11. The capacitor is first adjusted for maximum received noise on the operating frequency, then fine tuned for lowest SWR while transmitting. Tuning for maximum brightness on the the neon lamp coincided with maximum deflection of the field strength meter and was sufficiently close to minimum SWR. 12. 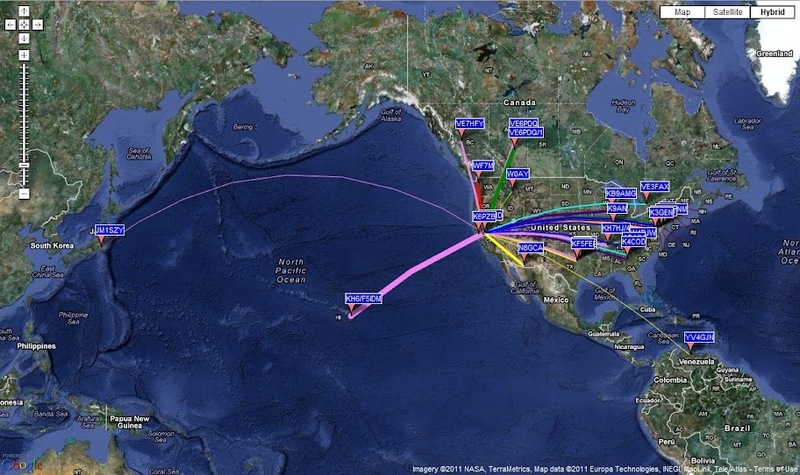 A test run of the magnetic loop antenna using 5 watt WSPR transmissions with a FLEX-1500 transceiver on 14 MHz yielded these confirmations of reception and transmission with Japan, Hawaii, Venezuela, Canada and the U.S. between 2226 UTC 01 JAN and 0356 UTC 02 JAN 2012. 13. Here is a high voltage shunt capacitor made from 61 cm (24 inches) of RG-58/U coaxial cable (approximately 60 pF). The 3 foot diameter magnetic loop antenna tuned from 9.35 to 11.8 MHz with this capacitor attached across the butterfly capacitor stator terminals. On 30 May 2013, a JT65 contact was successfully completed over 5,745 miles distance with EA7AH in Huelva, Spain, on 10.138 MHz using 30 watts and this capacitor on the indoor magnetic loop antenna. 14. Here is a high voltage shunt capacitor made from 154 cm (60.5 inches) of RG-58/U coaxial cable (approximately 150 pF) attached to the indoor 3 foot magnetic loop antenna. The antenna tuned from 6.86 to 7.67 MHz with this capacitor attached across the butterfly capacitor stator terminals. It handled 30 watts transmitter power with only some perceptible warming after several JT65 transmissions of 50 second duration. 15. The NE-2 neon lamp glows brightly at resonance during a 30 watt JT65 transmission on 7.076 MHz. 16. 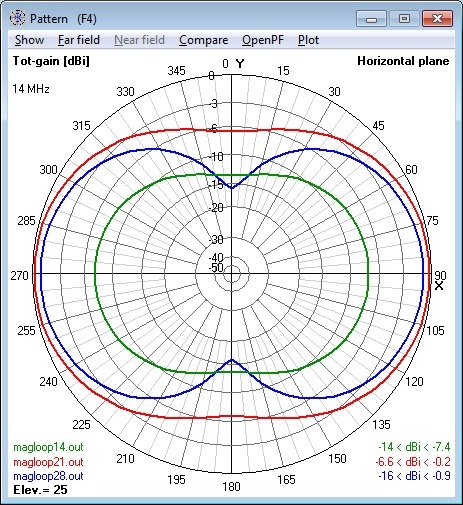 Azimuth Radiation Patterns for Magnetic Loop Antenna modeled for 14, 21 and 28 MHz at 5 feet above Average Ground (4nec2 model). 17. Elevation Radiation Patterns for Magnetic Loop Antenna modeled for 14, 21 and 28 MHz at 5 feet above Average Ground (4nec2 model). 18. This curve of the measured SWR demonstrates the narrow bandwidth of the Magnetic Loop antenna when the capacitor is adjusted to resonance near 28.4 MHz. The antenna should function satisfactorily within 30-40 kHz of this resonant frequency and significantly decrease noise and interference from undesired signals outside of this frequency range. The capacitor requires adjustment for operation on frequencies outside of this range. *A fixed capacitor connected in parallel across the butterfly capacitor allowed operation over either the 7 MHz or 10.1 MHz bands. These capacitors should be rated at 5 kV or better for 30 watt transmissions. Capacitor arcing occurs as the power approaches 50 watts. *FT114-43 Toroid core temperature increase measured during a 50-second JT65 transmission at 25 watts. This performance should be adequate for the lower intermittent duty cycles of usual operating modes. ** Maximum gain calculated with the specified NEC model parameters. *RG-8A/U braid conductivity derived from measured impedances. 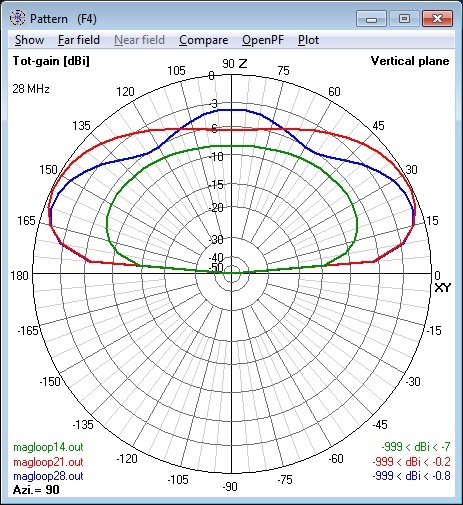 These 4nec2 model files have been validated for this magnetic loop antenna.